Pool memberships are valid from 7/1/18 – 6/30/19. New Pool memberships will be valid from 7/1/19 – 6/30/20. Open for residents and their guests; and non-residents with a pool pass. 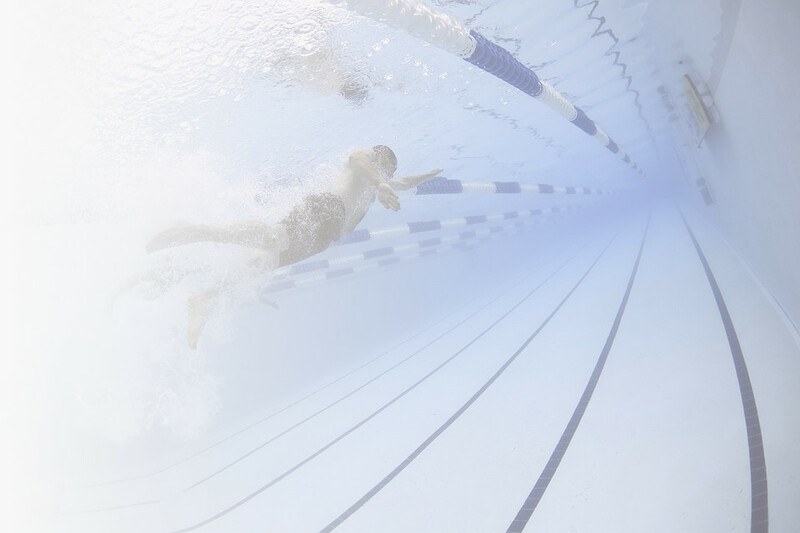 One lap lane will be available during Drop-in Swim (evening hours only). 1. Lifeguards have the authority to restrict inexperienced swimmers to the shallow end of the pool. Swimmers under the age of 6 are not allowed to swim without an adult. 2. No horseplay. No running on the deck. No pushing, no dunking or obscene actions in the pool. No hanging on the lap lanes. 3. No diving at the shallow end! 4. No glass bottles, food, or chewing gum allowed in area. 5. Non-swimmers must sit in the observation area. 6. No flotation devices of any kind allowed (only our bubbles can be used with a parent in the water). 7. Swimmers must take a warm, soap shower before entering the pool. 8. Only cotton, synthetic fiber swim suits allowed. (No “cut offs”, boxer shorts, etc.). 9. Patrons are not allowed to throw balls in the pool. Please be mindful of other swimmers in the area. Thank you. School events take precedence over all drop-in activities. Please check the daily calendar to find out if facilities are open. RESIDENTS OF HADDAM & KILLINGWORTH ONLY – MUST SHOW ID! RESIDENTS ARE ALLOWED TO BRING ONE GUEST EACH. NO FOOD OR DRINK ALLOWED IN THE FIELDHOUSE. TRACK AND BASKETBALL COURTS ARE TO BE USED FAIRLY. PLEASE BE COURTEOUS. BASEBALLS, SOFTBALLS, ETC. ARE NOT ALLOWED TO BE THROWN. SNEAKERS MUST BE WORN WHILE PLAYING BASKETBALL OR USING THE TRACK. NO BLACK, HARD SOLED SHOES ARE ALLOWED. NO THROWING BASKETBALLS AT THE WALLS OR DOORS. PLEASE PICK UP ANY LITTER OR BELONGINGS THAT YOU HAVE BEFORE LEAVING THE FACILITY. THE HK RECREATION DEPT. IS NOT RESPONSIBLE FOR ANY LOST OR STOLEN ITEMS. NO HANGING OUT IN THE HALLWAYS. The HK Recreation Dept. has compiled a list of babysitters. If you are looking for a babysitter, call us at 860-345-8334 or email us and we will give you names of sitters who live in your area. All students on our list have taken the American Red Cross Babysitting Course. Tickets available until August 30th. The HK Recreation Department has discounted tickets. Avoid waiting in long lines by purchasing tickets in advance at our office. What a great deal! Fun for the entire family! Tickets are good any day of the season – but please check with the parks to find out the dates they are open to the public! Fun roller coasters & the water park Hurricane Harbor make for a fun day for everyone! Savings: Save $31 from the gate price of $72 (54″ +) & $17 from the on-line & gate price of $58 (Under 54″). A fun park for the whole family to enjoy – and it is close by too! Cool off at Clipper Cove and Mammoth Falls. Enjoy Bayou Bay – thousands of gallons of water logged fun! 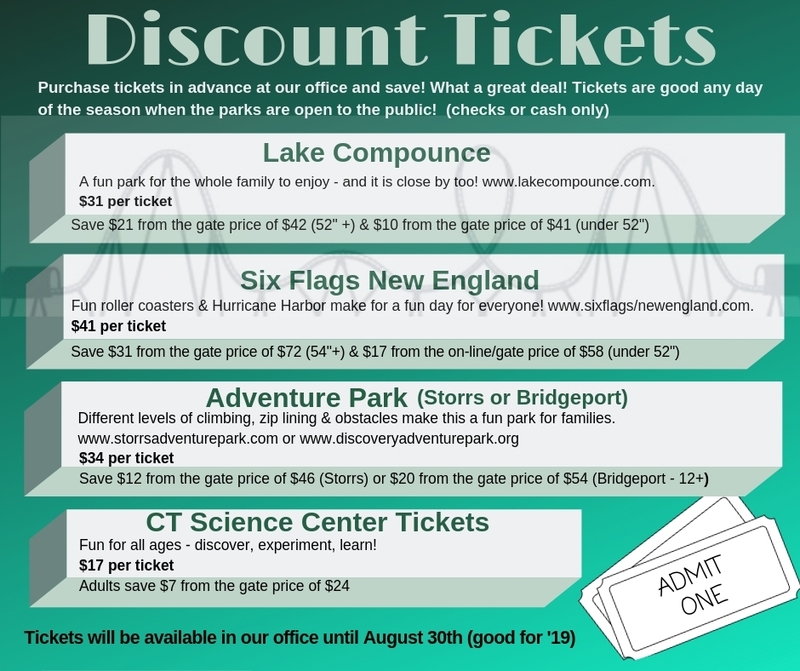 www.lakecompounce.com. Fun for the entire family! 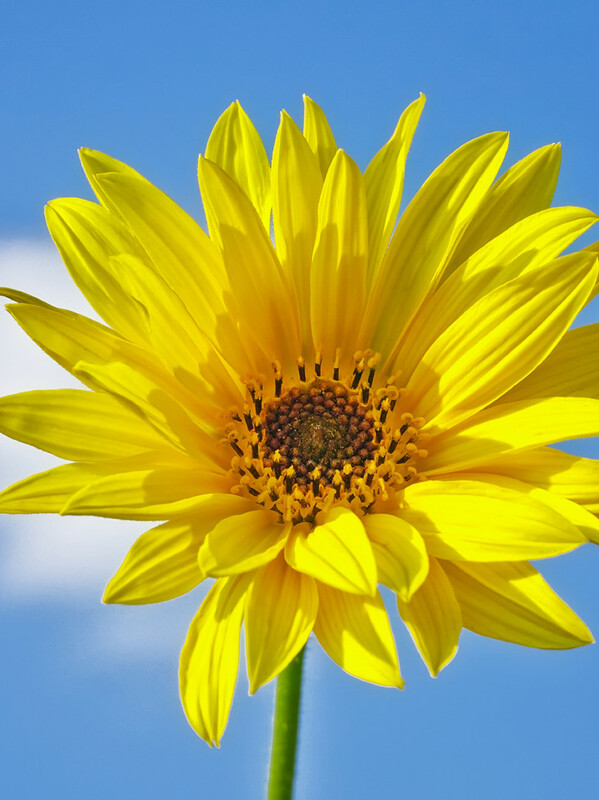 Tickets are good any day of the season – but please check with the venue! Savings: Adults save $7 from the gate price of $24! Different levels of climbing, zip lining & obstacles make this a fun park for families. Visit www.storrsadventurepark.com or www.discoveryadventurepark.org. The HK Recreation Department will assemble picnic kits for residents. Kits may include portable volleyball net, volleyball, softball equipment, pillow polo, drink coolers, whiffle ball equipment, etc. Kits are free, but a $15 refundable deposit is required. Please call 860-345-8334 in advance to reserve your kit. No knowledge of Chess is required. There are a lot of benefits for children who play chess including increased IQ scores, improved problem solving skills, ability to make difficult and strategic decisions independently and a fostering of critical and creative thinking. This class is good for all levels. $5 if you pre-register. $10 at the door. 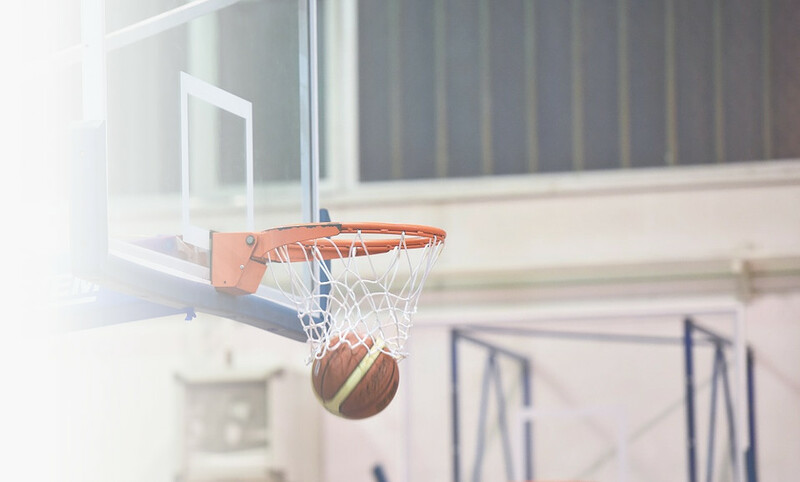 This recreational program is designed to promote basketball enthusiasm as much as basketball skill, fun, physical fitness, friendship and good sportsmanship. Each player will have one minute to shoot from “hotspots” placed on one half of the court. Starting at the center of the half-court line, the player dribbles into shooting range. The contest challenges a player’s speed, shooting, dribbling, and rebounding ability. Three one minute rounds constitute the duration of play for each player. The top scorer in each division will advance to the State Competition on Saturday, April 6th at the Old Saybrook Recreation Center, 308 Main Street in Old Saybrook. Return forms by February 15th to avoid late fee! For more information, please call 860-345-8334. 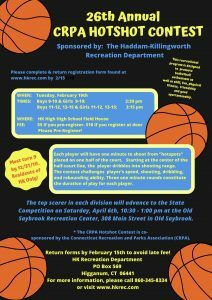 * The CRPA Hotshot Contest is co-sponsored by the Connecticut Recreation and Parks Association (CRPA).